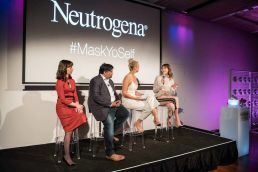 Top model and Neutrogena ambassador, Montana Cox, unveiled the Neutrogena® Visibly Clear™ Light Therapy Acne Mask to over 80 VIP guests at the Museum of Contemporary Art in Sydney. 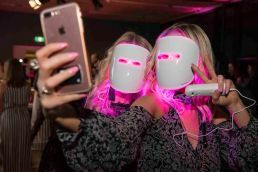 The revolutionary new product is a wearable LED device that delivers red and blue wavelengths into the skin at the speed of light to disrupt the acne cycle, with results after just one week. “I was so excited when I first had the opportunity to try this new product from Neutrogena. In my line of work, it’s important to have clear and healthy looking skin. The Neutrogena® Visibly Clear™ Light Therapy Acne Mask is so easy to use and helps me fight off breakouts and mild acne – because it only takes ten minutes, it fits in perfectly to a busy schedule like mine!”, says Montana. The mask is the latest example of the brand ® challenging the status quo to create innovations that redefine entire categories within the skincare industry—answering the needs of women and men around the world. LED therapy has been an effective in-clinic treatment for years, but it has mainly been available to those who have the time and resources for a series of appointments. 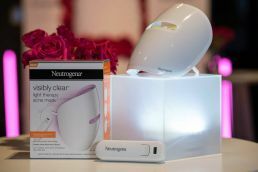 The Neutrogena® Visibly Clear™ Light Therapy Acne Mask uses the same technology offered by dermatologists at a lower energy level that’s simple enough to use at home for a fraction of the price. “Acne is a very common condition that affects more than just the skin – it can be a daily struggle for many teenagers and adults. LED therapy has been used by dermatologists for many years to treat acne. 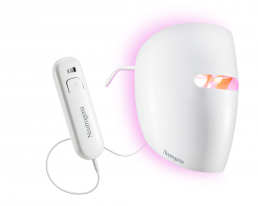 A multi-centre clinical study of the Neutrogena® Visibly Clear™ Light Therapy Acne Mask, performed on 52 subjects with mild to moderate acne, found that 80 percent of subjects showed fewer breakouts after just one week of daily treatments. And results continued to improve over time: after 12 weeks, 98 percent had fewer breakouts and 94 percent had smoother skin. Once only available in dermatologists’ clinics, LED therapy is a one-step acne treatment for your face that treats acne by reducing the existing inflamed breakouts and targeting spots before they appear. The research also showed that that the mask doesn’t just make users look better, it can make them feel better, too. In the same clinical study, 76 percent of users said that they had higher self-esteem after 12 weeks of daily sessions wearing the mask, with 69 percent reporting that they felt more comfortable interacting with others. All in all, 78 percent of the study subjects agreed that using the mask had improved their overall acne-related quality of life.